A two bedroom restored house with land for sale near Tomar, central Portugal. The house, which is set over one floor, is detached, though there is an adjacent building quite close to the main entrance. The house has been constructed in stone and rendered. The window and door surrounds are stone and the property is fully double glazed. There are traditional style Portuguese external shutters throughout the house. The house is connected to mains water and electricity and has tiled floors throughout. There is a living room with a kitchenette off. There are two bedrooms, both of which have built in wooden wardrobes. There is a fully tiled bathroom. The bathroom has a bath with shower above, toilet, bidet and pedestal sink. The house also has a large attic, which has a concrete floor and could be converted into additional living accommodation if required. The attic is accessed via an external staircase and there are several glass roof tiles, which provide light. There are several detached annex buildings to the rear of the house, which have been used for storage. These buildings are constructed in block and red brick. The property has around 7,760 square metres of land, the majority of which is flat. There is a diverse mix of mature fruit trees including Olives, Oranges, Lemons and Almonds. There are two large wells on the land, both of which have a good water supply and have been used for irrigating the land. 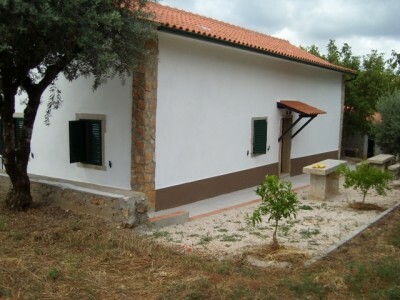 The property is situated in the village of Chãos in central Portugal. Chaos has several cafe bars, a butchers, bakery, mini-market and monthly vegetable market. The town of Ferreira do Zêzere, which is the district capital, is around 17 kilometres from the property. Ferreira do Zêzere has several supermarkets, banks, schools, bus station, shops, builders’ merchants, restaurants and bars. The larger, historic town of Tomar, which is home to the UNESCO world heritage listed Convento do Cristo, is approximately 15-20 minutes drive from Chãos. Tomar is a popular town and has all modern day amenities including supermarkets, shops, cafes, restaurants, library, schools, university, cinema, bowling alley, weekly market and a hospital.